Even when she isn't sure what to say. Even when Olivia misses months of school. To start off on a personal note I don’t like how this book is pitched as “following the tradition of The Fault In Our Stars” since I disliked TFIOS and under normal circumstances I would have completely skipped this just because of that one phrase, but I stumbled across a certain tweet mentioning how good this book was and so I decided to request it. That was the ONLY reason I did. I’m so glad I request this though! I haven’t had much luck with finding entertaining books since a few months ago, but this one I managed to finish in record time in between studying for exams. All I can say is, GUYS YOU MUST REQUEST THIS ON EDELWEISS & READ IT IMMEDIATELY. Usually when a book focuses on a character diagnosed with leukemia, I’m prepared to read this tough, heart-wrenching story about a disease that tears two star-crossed lovers apart. In this case however, it’s not a couple that’s torn apart, but two best friends. Olivia and Zoe are the kind of best friends who are joined at the hips; they do everything together, they live in their own little world, they tell each other everything and nothing can ever separate them. Basically, that’s the kind of friendship I’ve always craved but honestly, it’s not easy finding someone who you can just instantly and forever connect with. I think in some ways, this friendship was much more touching than a passionate, once-in-a-life-time-love between two people. I could feel how deeply Zoe cared and loved her best friend, and I feel like the chances of ever finding another soul-mate-like-best friend like Olivia is slim to none. I personally would say almost impossible. It’s not difficult finding friends who you have fun with and may become your best friend in the future, but I personally believe there are very few you can be so comfortable around you tell each other everything and act in any way you want. There is very little romance in the book, which I was both glad and a little disappointed about. Glad because it never overshadowed the central focus of the story, and disappointed because well…I really liked Zoe and Calvin together. I wish Zoe didn’t carry the burden of her best friend’s sickness all by herself; I wish she’d allowed Calvin to carry some of it for her. I would strongly advise having a box of tissues ready when/if you decide to read this. While I myself didn’t cry, this would certainly evoke tears in a lot of readers! (Especially since as I scroll down Maybe One Day’s GR page, I’m bombarded with all sorts of variations of ‘I cried so much’ or ‘be sure to have a box of tissues with you’.) I should clarify that while this failed to make me break down into tears, I did find this a fantastically written story, and certainly more touching in ways than many other books about leukemia. 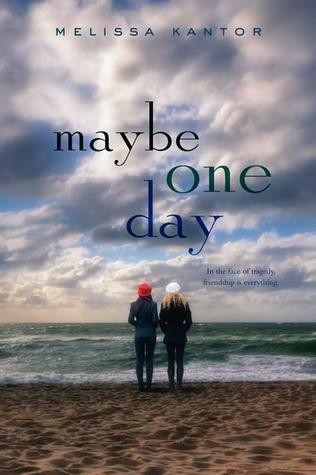 A massive thank you to HarperTeen & Edelweiss for providing a copy of Maybe One Day for review! OMG OMG I have a feeling I'll really like this. I totally agree with you about the best friend thing, I've never had one so I think this'll be interesting. In a way, the romance not overshadowing is rare in YA books and if done well, can make it even better - like This Song Will Save Your Life! aww.. i think you're right.. while two star crossed lovers torn from each other by sickness is sad.. i feel playing the best friends angle is just even sadder.. I wish I have a best friend like Olivia.. it really is rare and right now I'm sad just from reading your review. I agree, I hate when books are marketed for "fans of….." sometimes we end up missing out on such awesome books because of that phrase. Aww this is such an awesome review Shirley, you are the second reviewer I've seen that has adored this book (and they were an Aussie too) so now I know that I must give this book a try a lot sooner. I also appreciate books which make me cry, and I haven't had one of those in a long time!